A C-17 Globemaster cargo jet turns to make an approach to the runway at the Pacific Missile Range on Kauai. For nearly 12 years of flying, Maj. Jeff Beers has transported it all -- food, supplies, soldiers, even a defense secretary. "That was in 2004," said Beers from the cockpit of the 174-foot C-17 Globemaster cargo jet during a two-hour training mission Friday. "I guess you can consider that one of my most unique missions when we had to transport (then) Defense Secretary Donald Rumsfeld to Iraq." He recalled that during his first mission to Iraq, his cargo was 80,000 pounds of food. Before being stationed at Hickam Air Force Base, Beers said, he made numerous trips to Iraq and Afghanistan from staging areas like Diego Garcia, Germany and Qatar. For the past two years since it received its first Globemaster, air crews of the active Air Force's 535th Airlift Squadron and the Hawaii Air National Guard's 204th Airlift Squadron have been flying missions to all parts of the world. Their first humanitarian mission occurred last September when an Air Force and Hawaii Air Guard crew responded to the Filipino government's pleas after a devastating mudslide covered the village of Guinsaugon on Leyte Island. Last year, a Hawaii Air Guard crew from the 204th Air Lift Squadron delivered 27,000 pounds of recovery equipment, including four industrial water pumps, to Kauai after the dam at Ka Loko Reservoir broke, killing seven people and isolating residents and tourists on the island's North Shore. Capt. 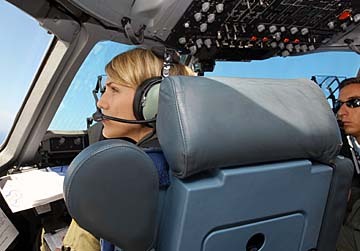 Chelsea Lamping helps pilot Capt. Jake Wilcox scan the skies as their C-17 Globemaster cargo jet makes an approach to the runway at Pacific Missile Range Facility at Kauai's Barking Sands. As the Air Force celebrates its 60th birthday this year, Hickam Air Force Base is the first outside the mainland to permanently host these long-range cargo jets. There are eight assigned to the Hickam unit. By 2011, the Air Force's newest and most expensive jet fighter, F-22 Raptors, will be flown by air crews belonging to the Hawaii Air National Guard's 199th Squadron and the active Air Force's 531st Squadron. Beers said the C-17 Globemaster crews practice flying in formation at least once a week. The number of aircraft range from two to four. Usually the crews are in the air for as long as four hours. "Formation flying allows us to deliver more people and cargo to any location at any one time," Beers said. 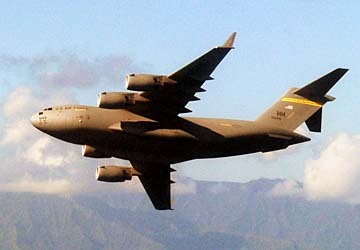 On Friday, two C-17 Globemasters took off from Hickam just a few minutes apart. The training flight involved simulated landings at the short runway at Pacific Missile Range Facility at Kauai's Barking Sands. Beers said C-17 Globemaster jets can land on runways as short as 3,500 feet and on surfaces as unimproved as dirt. By contrast, the runways at Honolulu Airport are 12,000 feet long. The two aircraft also simulated parachute drops. Each C-17 can carry as many as 102 paratroopers. The drops range from as low as 550 feet to more than 5 miles. The Hickam unit has used drop zones south of Turtle Bay and Schofield Barracks. On Friday, Mayor Mufi Hannemann signed a proclamation honoring the Air Force on its 60th birthday. Honolulu is one of six cities, along with Phoenix, Sacramento, St. Louis, Boston and Atlanta, designated to host Air Force Week. Other events this week will include performances by the Pacific Air Forces Band at 2 p.m. today at Kahala Mall and again at noon Tuesday in Tamarind Park. A free Air Force concert will be held at the Waikiki Shell on Wednesday at 7 p.m.
On Friday, Gov. Linda Lingle and other dignitaries will attend the Air Force's 60th anniversary birthday ball at the Hilton Hawaiian Village Coral Ballroom. Lingle has already proclaimed 2007 as the Year of the Air Force, which became a separate military branch on Sept. 18, 1947. The highlight of the week will be an aerial show by the Thunderbirds -- the Air Force's air demonstration team flying F-16 jets -- beginning at 2:30 p.m. Saturday off of Fort DeRussy in Waikiki. The last time the Thunderbirds performed over the beaches of Waikiki was in 1997. » Aug. 19, 2004: Groundbreaking of a $30 million Hickam Air Force Base C-17 Globemaster jet transport operations, training and maintenance center. Total cost $190 million. Operational summer of 2005. » February 2005: The first class of Hawaii Air National Guard C-130 cargo pilots returns from Altus Air Force Base in Oklahoma after four months of C-17 transport jet transitional training. » March 21, 2005: The first rivet of a Hawaii-based C-17 is driven at Boeing Co.'s Long Beach facility. » August 2005: Hickam's three-building complex housing the active-duty 535th Airlift Squadron and the Hawaii Air National Guard's 204th Airlift Squadron becomes operational. » Aug. 12, 2005: Hickam's $35 million C-17 cockpit simulator arrives. » Aug. 18, 2005: Hickam's first C-17 cargo jet is blessed at Boeing's Long Beach plant. » Feb. 8, 2006: First of eight C-17 Globemaster jet cargo transports arrives at Hickam. The remainder will be sent to Hickam at a rate of one each month.